Quintessential New England, Thayer’s Inn has been welcoming guests since the mid nineteenth century. 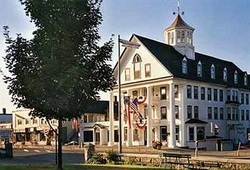 On the National Register of Historic Places, it has a total of 40 guest rooms and is ideally located for those wishing to explore the White Mountains. It is said that Ulysses S Grant addressed an audience from the hotel balcony in 1869, while other famous guests include President Franklin Pierce, General George McClellan, Henry Ford, P. T. Barnum, and General Tom Thumb. Numerous other late-twentieth century figures have also spent time here including Richard Nixon, Jimmy Carter and George H. Bush.